For over 75 years, our school supports boys with specific learning difficulties in realising successes far beyond their expectations. Whilst our academic results at GCSE, A Level and BTEC are consistently above the national average for all schools, the education experienced by More House students is much broader than exam syllabus prescription. 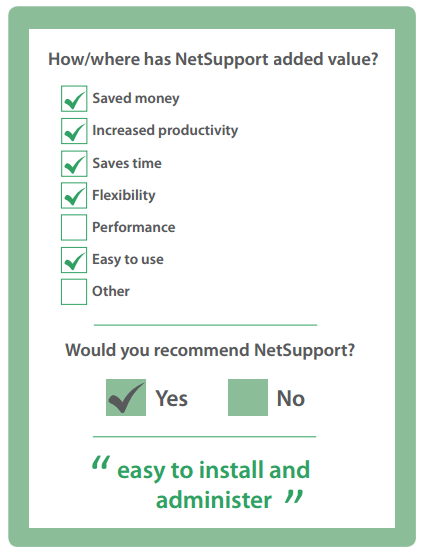 Why did you choose NetSupport DNA? Our Internet filter software, although very good, does not offer reports that can be used and understood by non-technical members of staff. We looked at other software packages, but the ‘footprint’ required by the software caused some considerable performance issues for some staff. DNA is not only easy to install and administer, it is also very easy for staff to use. We are currently using the software to monitor Internet usage on our 300+ desktop and laptop computers. Staff are now able to see what year groups are doing when online and flag any activity that may be of concern to them. We are also able to provide pupils with a safe means of contacting staff if they feel the need to – and this need not be about online issues. The software has also proved very helpful with finding computers that have problems. We have also used it to provide us with a list of current computer specifications, allowing us to formulate a plan of hardware replacements/upgrades throughout the network. It has been very quick and simple to design and run reports for staff to see what is going on on-line in the school.